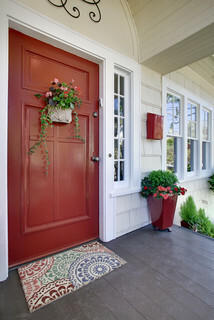 Paint your front door: A red front door is a classic way to make your entrance warm and welcoming, but other colors look great too. 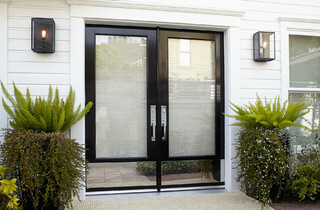 Be sure to choose a shade that’s on the darker end of the paint strip so your door stands out but doesn’t dominate. Pick a high-sheen paint for a bit of a gleam with a practical side—you can easily wipe away fingerprints. Put on some bling: Adding a metal kick plate and other decorative hardware, like an upgraded lockset and door knocker, gives a solid, finished appearance to the whole door. Choose an antiqued bronze or black finish for a warm and stately look, or a brushed nickel or chrome for a minimalist modern feel. Wreaths are a traditional symbol of harvest abundance, and indicate a warm welcome inside. A boxwood wreath looks great for months, spans holiday seasons, and works with traditional or modern looks. 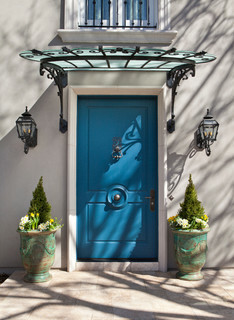 Flank with planters: Adding planters to either side of your entry increases the visual importance of your door. A symmetrical arrangement, like topiaries, lends a stately and classic look, whereas a grouping of flowering pots feels free-spirited and connotes casual charm. If you don’t have a green thumb, ask your local garden center about low-maintenance bushes that can be trained to grow vertically. Provide a perch: Even if no one ever sits in it, a chair by the door denotes comfort and hospitality. It’s also a handy place for packages to be delivered or picked up. Consider teak or wrought-iron, and accessorize with pillows made from weather-resistant outdoor fabric. Do tread on me: Doormats take a lot of abuse—and it shows! Take a look at what’s outside your door and evaluate it from a visitor’s point of view. Ready for a change? 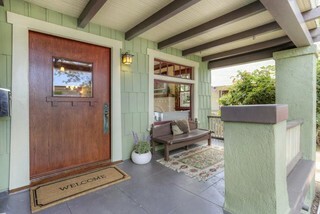 A large doormat that includes some decorative elements is a subtle but worthwhile upgrade. Leave the light on: Nothing says “welcome” like the beacon of a porch light. Selecting a design that echoes the look of your house is the first step, making sure the finish coordinates with your front door hardware. Next, choose a light bulb that casts a warm glow, with a color temperature of 3,000K or higher. 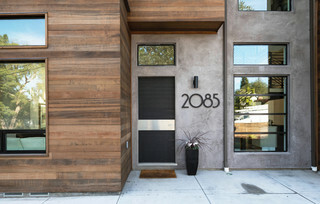 While you’re at it, be sure your house numbers are easily seen at night, so your guests can knock with confidence. You’re ready! Light some glowing candles, start your playlist, and enjoy a wonderful evening with family and friends.